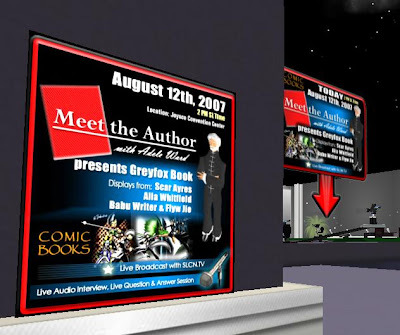 Flyw Jie and I exhibited The Lemon Princess on August 12 at SL's Joysco Convention Center during the reading and discussion with noted comic book author Greyfox Book (aka Jon Klement in real life). We were pleased to be asked to exhibit by Jilly Kidd, and grateful for the set up assistance provided by Johnny Austin! Joysco is a spacious, airy venue and we look forward to exhibiting there again during notable literary events. The Book Fair is over and our lease is up. In fact the entire Book Publishing Village is moving to Book Island. I took a couple of pics of our booth before moving out. This second one includes one of Flyw's pictures from his visit to the Cantal region of France. What a beautiful image, Flyw. Thanks for putting it up! So what's next for The Lemon Princess? A RL book proposal. Working on it as we speak. Flyw has been working hard ever since the SL Book Fair to complete the trailer for The Lemon Princess. This is a little teaser to draw readers into the inner world of The Lemon Princess. OK, so what's the mystery? A novel about a princess story? That's right. The princess story is written in SecondLife by Babu Writer. When that is done, the real person behind the avatar will stand up and complete the real story of the novel. The protagonist in the novel is none other than Babu Writer herself, a writer of children's stories. She has written the story of The Lemon Princess for a child, her child. We hear this child's voice, asking questions. Babu answers. The pair has a close relationship. But where is the child? Why do we never see her? Is she a ghost? Did she ever really exist? Is she a figment of the imagination? Why is she haunting Babu? Why does this tale grow increasingly dark, even as the story of The Lemon Princess grows cheerful and bright? You will have to read the novel to find out. 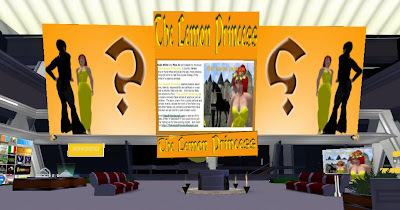 The Lemon Princess booth won $1000L for best booth display at the SL Book Fair, held April 20-22, 2007 at The Book Publishing Village in Wallaby. We're told there was RL press coverage in some trade publications, and there was even a story on BBC4. As a result of doing well as the Book Fair, on Sunday evening, Babu Writer was invited to read some of her poetry at The Blue Angel, and she did. We think it was well received. It was fun... and well, perhaps there is something serious brewing in that department as well. One can only hope.